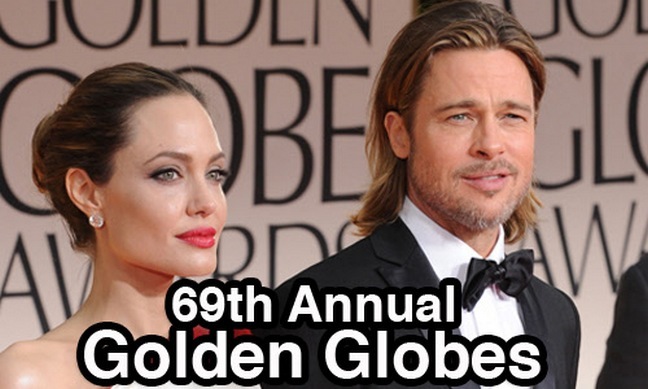 Take a look at the red carpet fashion hits and misses from the 2012 Golden Globe Awards. Angelina Jolie went with a Versace gown with a splash of red for fun. Brad Pitt is still sporting a cane after injuring his knee. Charlize Theron showed some leg in this stunning pale pink Dior Couture gown. ‘The Big C’ star Laura Linney. I’m disappointed she didn’t win her category last night! She is PHENOMENAL on that show! ‘Glee’ star Lea Michele in one of the only daring and fun dresses of the evening! Everyone played it pretty safe last night on the red carpet! Madonna looked fabulous, but it seemed like one good sneeze and her ‘girls’ were gonna burst out of that gown! Natalie Portman chose a hot pink strapless gown this year. Nicole Richie was beautiful in a silver Julien Macdonald gown. Reese Witherspoon was all smiles in this peony Zac Posen bustier gown. ‘Modern Family’ star Sarah Hyland in a vintage Dolce & Gabbana gown.